The first all-iron printing press, the Stanhope was invented around 1803 in England by Charles, the third Earl Stanhope, who devoted his life to science and technology, and especially to attempts to improve the techniques of printing. He never patented his press, preferring to make it and its advances available to all. The earliest Stanhope presses were made by Robert Walker and the press on display with serial number No. 535 was built in1837 by Samuel James Spiers, son-in-law and successor of Robert & Sarah Walker in Soho in London. Later Stanhope presses were manufactured by at least 40 other press makers in England, Belgium, France, Germany, Italy & Sweden. The Stanhope is a screw press on which the the screw’s leverage is compounded many times over by a system of levers. Augmenting the power of thepress in this way improved upon the design of the wooden hand press, with its single lever used operate the screw. 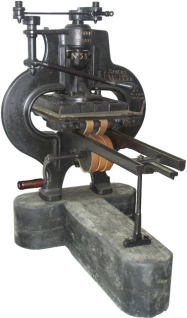 Stanhope’s improvement was in fact the first major change to the hand press in the roughly 350 years since Gutenberg first developed it. Very heavy and powerful, with a stout iron frame, the Stanhope was welcomed in Europe as a successor to the old wooden presses. Stanhopes were even imported into the United States, though rarely, before the appearance of the American iron presses of the 1820s, such as the Smith, Stansbury, Washington, and Wells. Erik Desmyter is researching the history of the Stanhope press and hopes to publish a book in the future. He invites questions and information about the press.